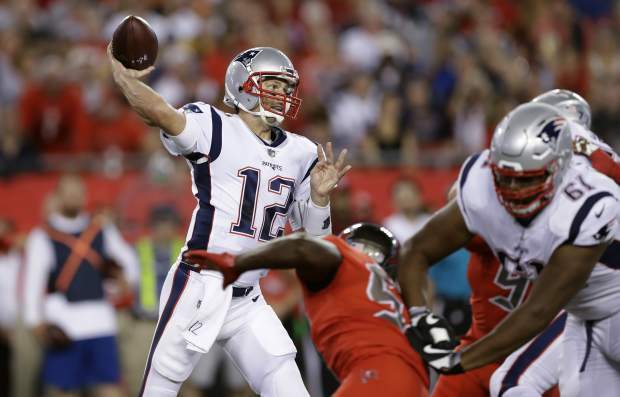 TAMPA, Fla. — Tom Brady threw for 303 yards and one touchdown, and New England’s porous defense showed signs of improvement Thursday night in a 19-14 victory over the Tampa Bay Buccaneers. The Super Bowl champions rebounded from a last-second loss to Carolina, despite Brady turning the ball over twice — on his first interception in eight regular-season games and a fumble on one of Tampa Bay’s three sacks. Neither of the mistakes led to points for Tampa Bay (2-2), which was unable to do much offensively until the fourth quarter. Jameis Winston rallied Tampa Bay late with an 18-yard TD pass to Cameron Brate that trimmed New England’s lead to 16-14 with 2:09 remaining. He marched the Bucs from his 25 to the Patriots 19 before throwing an incompletion on the final play. It might not have come down to a last-second drive if not for another poor performance by Bucs kicker Nick Folk. Folk missed two field goals and an extra-point before beating the New York Giants on a last-second kick last week. He missed three more field goals Thursday night, including a 31-yarder that would have cut a nine-point deficit to six in the closing minutes. Winston finished 26 of 45 with 334 yards and zero interceptions. DeSean Jackson had five receptions for 106 yards. Playing without injured tight end Rob Gronkowski (thigh), Brady finished 30 of 40 with one interception.